Hi there! 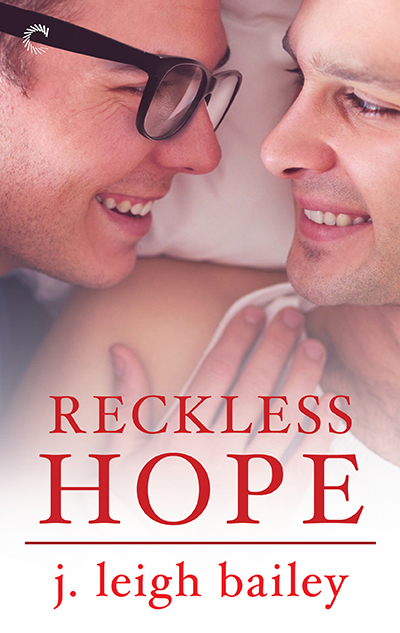 Today I’m sharing my review for a contemporary New Adult M/M romance, RECKLESS HOPE, by j. leigh bailey. This is the second book in the Letting Go series, about young men who find love when they are least looking for it. I really enjoyed NOBODY’S HERO, and I found RECKLESS HOPE to be a touching story about living through loss, and making the best of bad circumstances. Micah Burke is 19 going on 62. He is the guardian for his 14 y/o sister and caregiver to his paraplegic mother. Two years ago his alcoholic parents were responsible for a car wreck that killed his father, paralyzed his mother, and killed three others. Since then he has had to take on two jobs and the role of parent. He barely makes ends meet and only goes out one night a month–one night of dancing–where he meets Sebastian Carlisle. Sebastian Carlisle is as rich as they come. He’s a sophomore at Northwestern and an entitled prick with a sad history–his twin died of leukemia four years ago. His parents have pretty much moved to Europe and his only remaining family is his wealthy, but strict, grandfather–who absolutely does not approve of Sebastian’s risky life choices. Since then, Bas has lived his life on the edge, never showing his tenderness or vulnerability to anyone. Something about staid and sober Micah calls to Bas, reminds him of his conscientious and caring brother. The closer Sebastian gets to Micah, the more Micah tries to push him away–at first. This is a definite hurt/comfort story of two lonely young men looking for a partner who can be a support, not a burden. Micah is the first guy Sebastian has met in a long while who wants nothing from him–not money or contacts or anything, except a bit of fun now and then. Micah is sure being with Sebastian is a mistake–that he will let Micah down, just as everyone else in his life has. He’s so sure that he continually pushes Sebastian away, even when he truly needs his help. I did like when Micah opened up, and asked Sebastian for help. And Sebastian’s response was way past stellar. I loved how Sebastian just meshed with the most difficult people–cantankerous old men and wild teens. He saw pieces of himself reflected in others and decided that he didn’t need to live up to his brother’s memory–rather he could behave like someone his brother would have been proud to know, and love. It was a very touching coming-of-age. These guys are young for all the tragedy in their lives, but the end speaks of happier days and a brighter future together. Expect a bit of angst and a decent amount of sexytimes. Interested? You can find RECKLESS HOPE on Goodreads, Amazon, Barnes & Noble, Kobo, iBooks. I received a review copy of this book via NetGalley. Click the Rafflecopter link below for your chance to win ebook copies of both book sin the Letting Go series.